The Museum is housed in the Church and in the Convent of St. Francis which have been appropriately used as exhibition spaces. 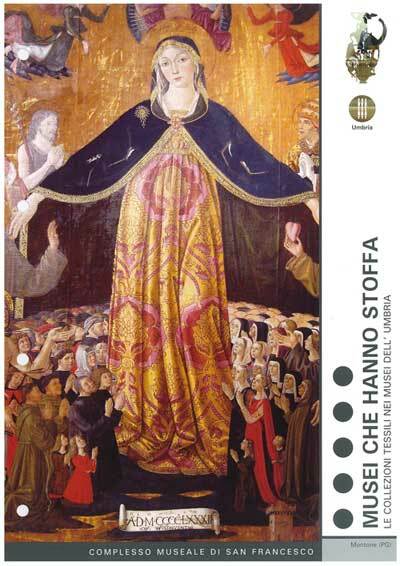 The large collection of textiles from the suppression of religious corporations is noteworthy and consistent; it has been stored in the Cloister of St. Agnes from Montone until the eve of the museum’s opening. 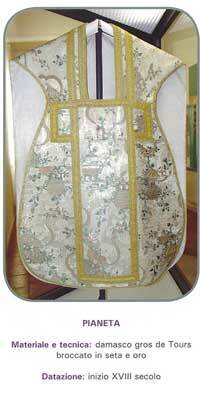 The collection is exclusively made up by various typologies of vestments and liturgical equipment such as copes, chasubles, stoles, maniples, “tonacelle” (little tunics), surplices, “amitti” (a rectangular piece of fabric worn under the surplice by the priest), chalice’s veils, corporal’s bags, altar’s tablecloths, umbrellas for viaticum, processional banners. All these items cover the period between the 15th and the 19th century. 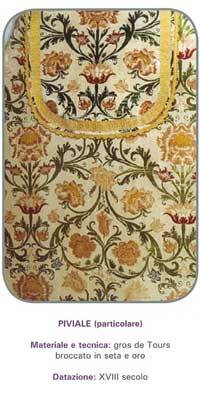 Only a small part of the textile heritage preserved is actually exposed; particularly noteworthy are: a set of chasuble, stole and maniple of silky and silver chiseled velvet dating to the 15th – 16th century, which has gallons with silver thin layers and ivory silk spun dated to the 17th century; a 18th century cope in silky and gold gros de Tours brocade which has a luxurious decoration consisting of racemes and flowers of peonies, tulips and roses; a chasuble with stole, maniple, chalice’s veil and corporal’s bag in silky and gold brocade of damask dated to early 18th century and stylistically related to the production of “bizzarres” silks. A consistent presence of so-called “alla perugina” fabrics must be added to this collection; these fabrics are characterized by a basic white linen fabric with a plain weave, a twill or a “Bird’s eye” and by a cotton decoration in indigo blue colour in horizontal bands. 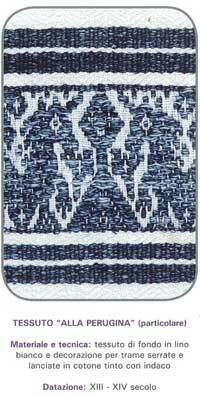 From the 13th century, the two-colour style and the decoration centred on geometrical patterns, real and fantastic animals and trees of life constitute the fundamental character of this production which began as aristocratic weaving then moved to liturgical one. An example of this type of fabric can be traced in the fresco representing the “Nativity of Mary” in the Church of St. Francis, particularly in the towels used by the maids taking care of St. Anne who has just given birth to Mary.